This is the week of finishing things. 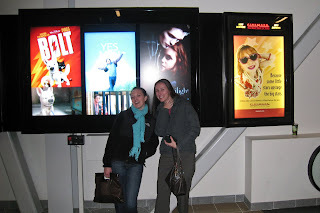 I finished reading Twilight, which meant that I had to go see the movie. Kelly, Jenna, and & Logan were kind enough to join me last night. I can easily say I was disappointed. By the way they changed the story, by the special FX, and by the acting. I thought that Bella, Edward, Alice, Matt, Billy, and Jakob's characters were cast really well. At one point it was so bad, Jenna asked if we were watching the Disney channel. I loved the book, so much that I've picked up New Moon and I'm nearly halfway through it already. I finished my first scarf and its with its new owner. I didn't get to take photos of it in nice lighting, so I decided a goofy photo in the movie theater would work just fine. I think this scarf took me a little over three weeks to make. 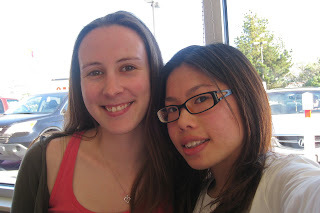 I met up with Cindy at In & Out for lunch the other day. It was great to see her. 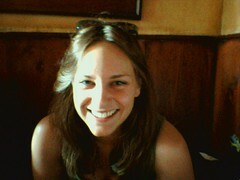 She is hoping to intern at San Jose State University. We took this photo to make Lisa jealous. ;D We went to Kristi's on Saturday for Crop/Guitar Hero/Breakfast night. She fit 1o people into her apartment and I was impressed! She's such a great hostess. 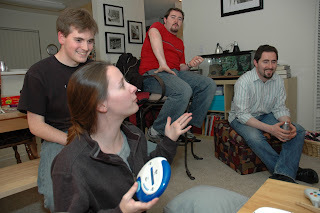 Kristi took this picture of us playing Catch Phrase. I managed to scrap at least a page! Of course I can thank my speed to the January Challenge over at Scrap Gal. Here is my take on it: And finally, I figured I should share a fun photo from my shoot last week. I had a lot of fun incorporating Gabby the dog into a few shots. I've got plans for another shoot this week and hopefully I'll get my business cards printed! Love this post chickie! Totally bummed that you didn't like the movie, but I think you just made me happy that I'm reading the book AFTER having seen the movie. Also, diggin the picture of Catch Phrase even if it's a total flop of a "correct" photo. How cute Ethan with his eyes closed. 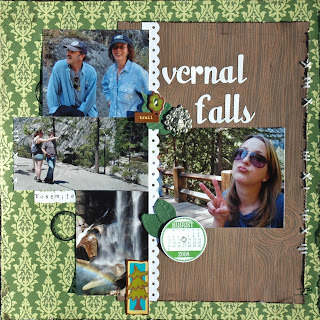 And lastly, super duper love for the ScrapGal layout! Oh and the portrait with the doggie, wicked nice! mmh - I wonder if I should even watch the movie.- LOL. Awesome layotu!!!! Loving that layout Missus, so dang cute. I am surprised you dont collapse sometimes, you have such a busy life!! Nice LO! I totally agree with you about the movie. It coulda been WAAAAY better.